When activated, hydromassage jets produce a continuous (not pulsating) spray of water to create a therapeutic massage effect for the muscles and skin. In some models the jets operate in unison while in other models the jets can be sequenced. 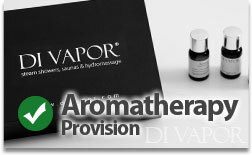 Aromatherapy is the use of plant extracts, also known as essential oils for the purpose of aiding in a persons mood, health or cognitive function. Oils can be added through the steam outlet and will be dispersed as the cabin fills with steam. 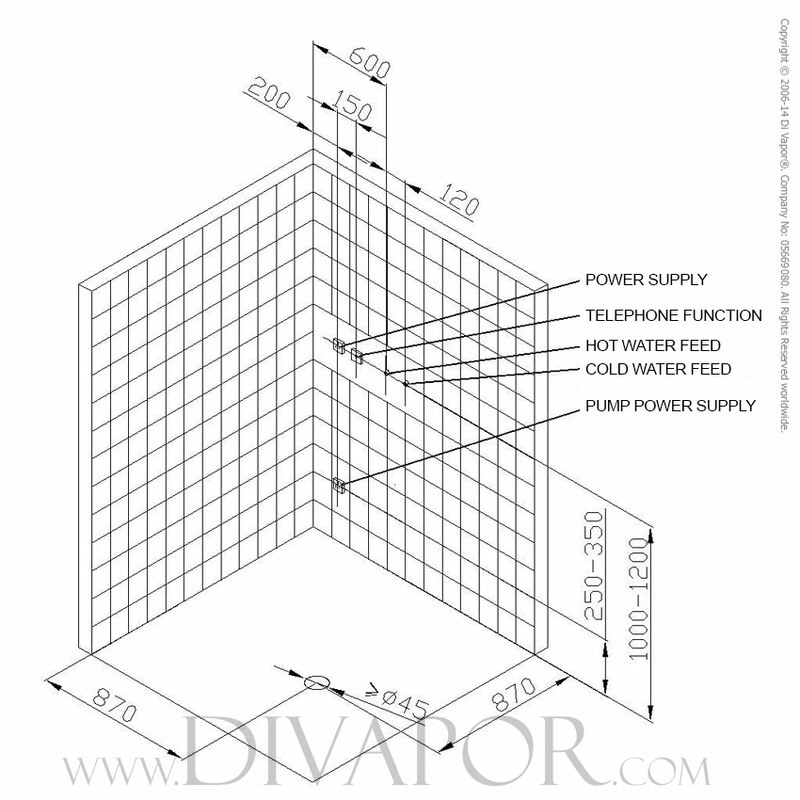 An enclosed shower cubicle that includes a steam generator that can generate heated water vapour to fill the cubicle. 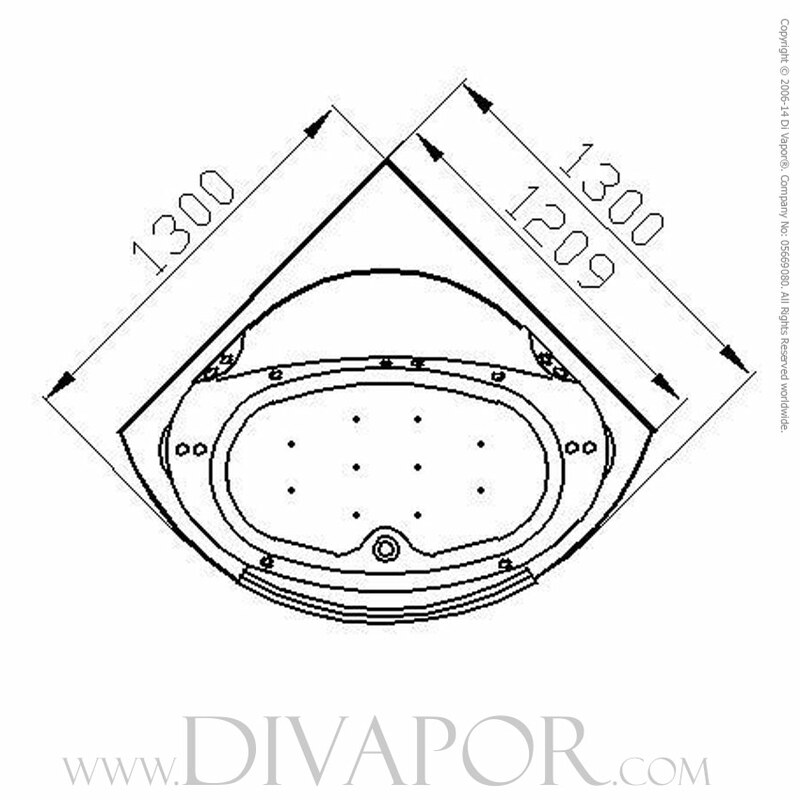 This is likened to a steam room but designed for a home bathroom environment. For a complete home spa experience, the Superior provides a seamless combination of shower enclosure, steam shower and hydro massage whirlpool bathtub all within the same cabin. In addition, the Superior features dual showering heads, hydro massage body jets, whirlpool bathtub, digital control panel & thermostatically controlled water temperature amongst other features. The unique transparent window at the front of the bathtub makes the Superior a modern addition to any bathroom. RCD supplied as standard on main power flex. Hot & cold mains feed required. 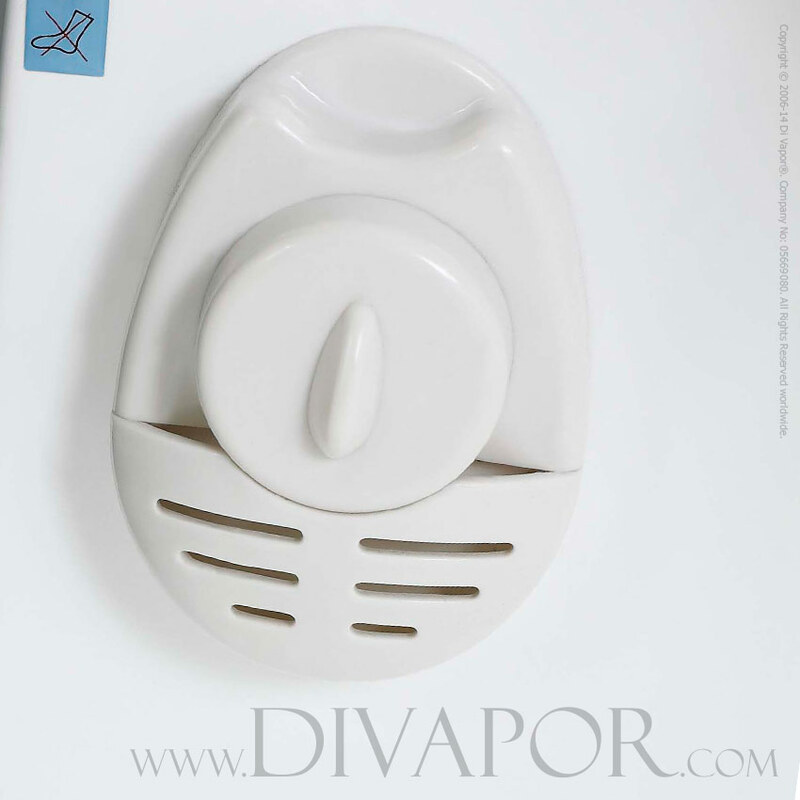 The Superior comes complete with the unique Di Vapor steam outlet, allowing you to take full advantage of your favourite aromatherapy scents during a warming steam session. The easy to use receptacle requires just a few drops of concentrated aromatherapy oil to instantly transform your steam session. The Superior comes complete with a dedicated steam generator mounted at the back of the cabin, designed to produce steam at the touch of a button. The wall mounted digital control panel allows users to easily set the desired temperature and length of your steam session. 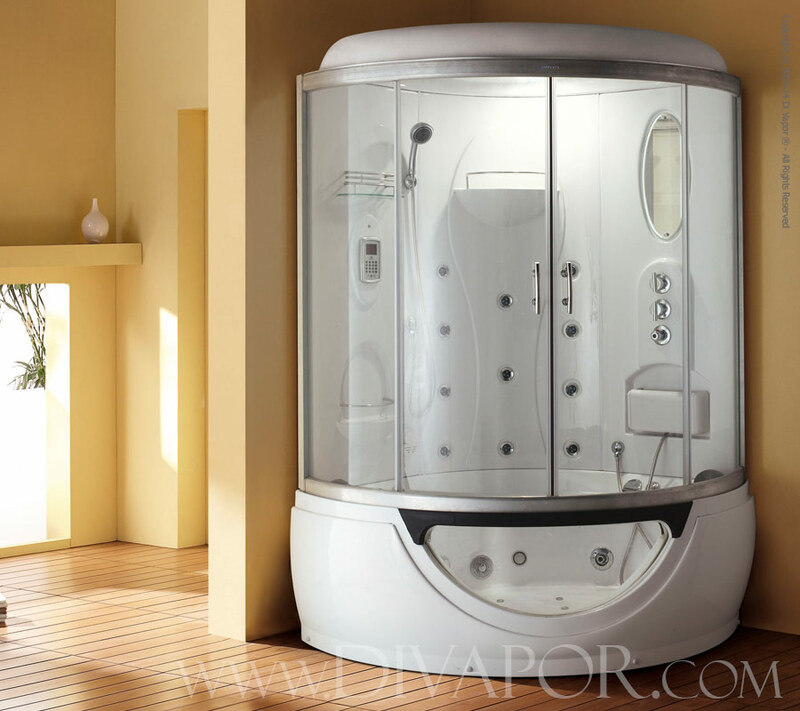 The Superior steam shower enclosure comes complete with a built-in steam generator mounted to the back of the steam cabin. 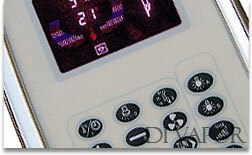 This control panel can be programmed by the user, choosing the desired temperature and duration of the steam session. 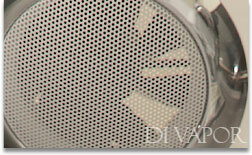 The Superior steam shower enclosure comes complete with ozone sterilisation or "active oxygen" fitted as standard. 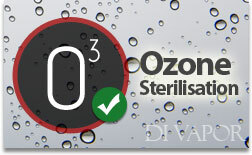 Ozone sterilisation works organically to eliminate any unwanted bacteria and viruses that may build up in the cabin during steam use, automatically activating after every steam session. 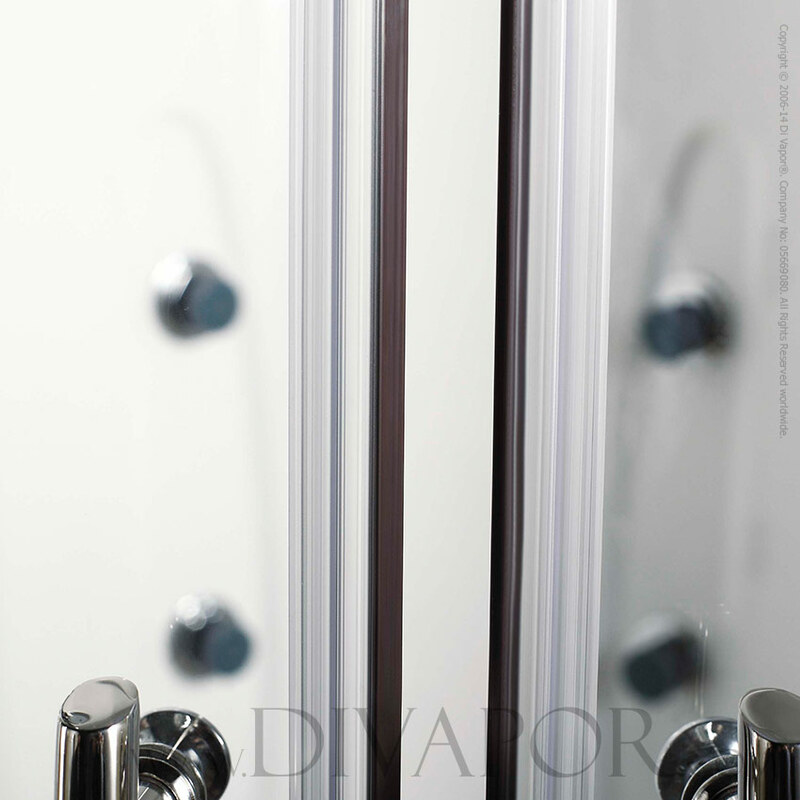 As with all Di Vapor steam shower enclosures, the Superior comes complete with a thermostatic temperature valve as standard, seamlessly regulating the water output temperature from the various features within the cabin. 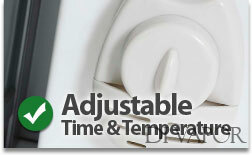 Bursts of scalding hot water and chilling cold water are a thing of the past. To ensure you're as comfortable as can be whilst relaxing in your steam room, the Superior comes complete with a padded seat located in the corner of the cabin. 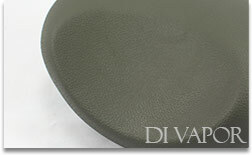 The removable seating pad makes cleaning and long term maintenance easy and straight forward. 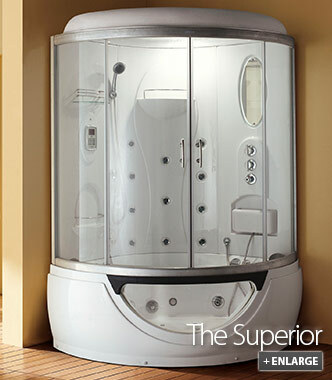 The Superior comes complete with 6 side mounted water jets, powered by a 1HP water pump situated underneath the whirlpool bath. In addition, the floor of the tub is lined with air jets powered by a dedicated air blower pump. 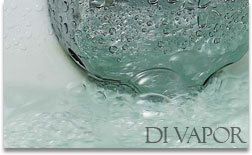 The combination of both the water and air jets provides a rejuvenating bathing experience like no other. 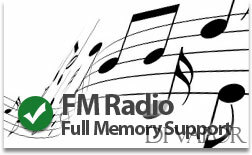 The Superior comes complete with a fully programmable FM radio with memory support for up to 10 of your favourite stations. The cabin can also be connected to a variety of external audio devices via the external AV connector, so you can listen to your favourite music whilst enjoying a relaxing steam session (AV cable bought separately). Mounted along the main back piece, the Superior provides 11 dedicated hydro massage body jets which can be adjusted to different heights and directions. You can utilise the body jets to soothe aching shoulder joints and back muscles, before enjoying a drenching monsoon shower for a truly invigorating experience. 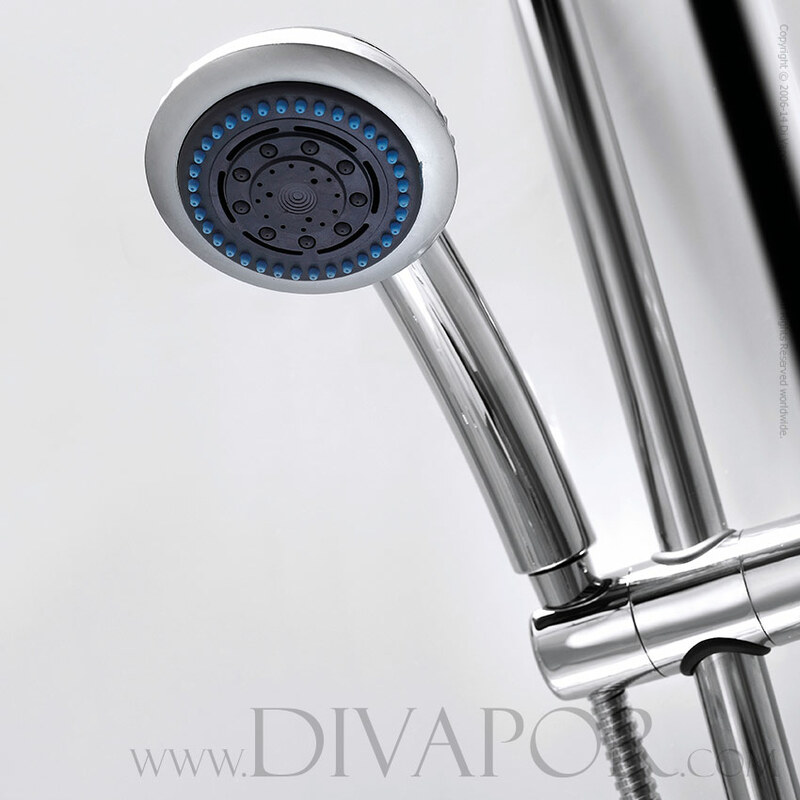 Mounted within the main roof panel above the user, an 8 inch monsoon shower head is included with the Superior as standard. 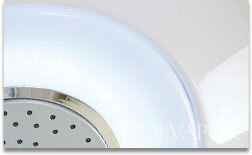 A gentle flowing shower head, users can enjoy a complete soak after a warming steam session. In addition to the overhead monsoon shower, the Superior comes complete with a wall mounted hand held shower ideal for "every day" showering. 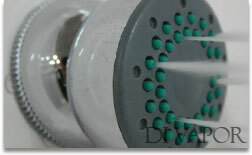 The handheld shower is also useful for rinsing down the entire cabin after use. The Superior comes complete with a twin glass sliding door entrance, housed within an aluminium rail for added strength and durability. 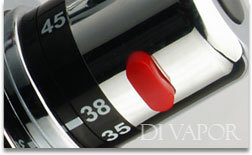 The carefully engineered door rollers ensure that the doors open easily and fluid. 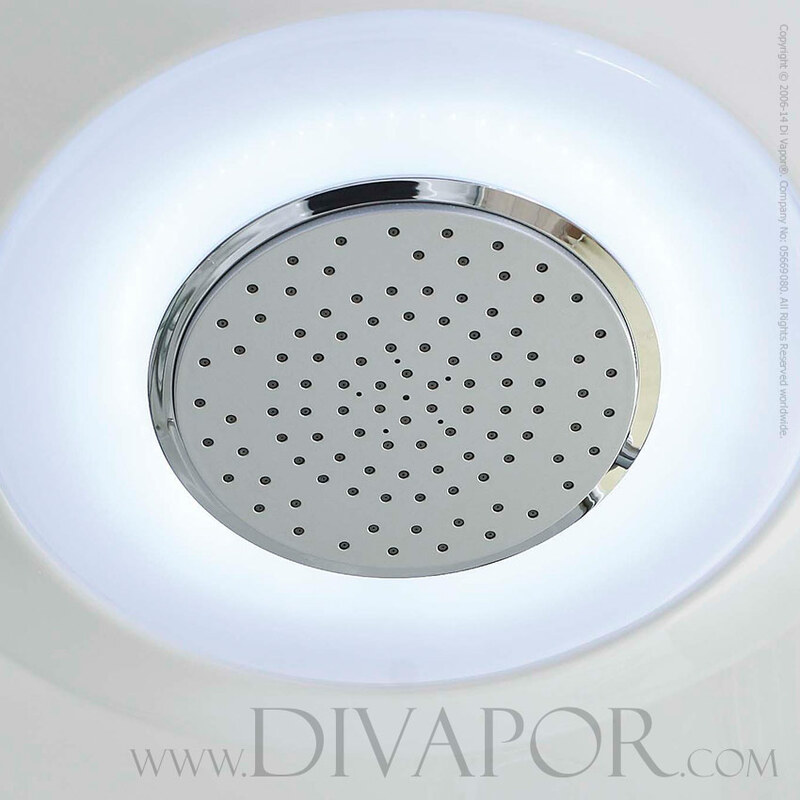 Surrounding the main overhead monsoon shower, a circular L.E.D light provides a dedicated downlight within the steam shower enclosure. The lighting helps to illuminate all the internal features of the cabin, whilst providing additional light within the room. 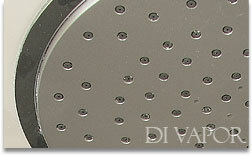 Di Vapor takes great care in the manufacturing and workmanship involved with every shower cabin and bathtub. The Superior follows suit, constructed from high grade acrylic throughout reinforced with fibreglass for added strength and durability. To help maintain an equal temperature throughout the entire cabin during a steam session, The Superior comes complete with a roof mounted circulation fan as standard. A gentle flow of air into the cabin keeps steam moving during a steam session, preventing steam from rising and settling at the top. 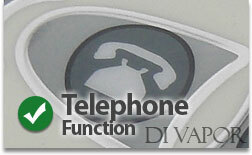 The Superior comes complete with a telephone function, ensuring that you don't miss any important incoming calls. Simply connect to a standard telephone socket using the appropriate connector to make and receive calls. If you'd prefer peace and quiet simply leave this function disconnected. The Superior steam cabin is fitted with automatic safety features as standard, ensuring that no damage is caused to the cabin during the unlikely event of an electrical surge. 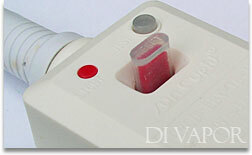 In addition, the cabin comes complete with a Residual Current Device (RCD) for added peace of mind. 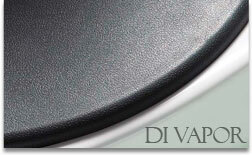 The Superior comes complete with a dedicated foot massager, which can be wall mounted out of the way when not in use. 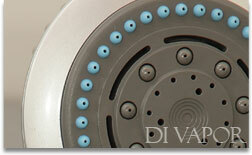 A combination of moulded rollers and directional water jets help to ease sore feet easily. The Superior comes with a set of hot and cold braided hoses, ready to connect to any compatible water supply. 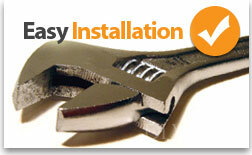 The unit is also supplied with a waste trap and flexible waste pipe. The unit also comes in "flat pack" panels designed to go through doorways and up stairways. The Superior comes complete with dual headrests to maximise comfort when using the whirlpool bath. The headrest is attached to the side of the bath using a pair of suction cups, allowing for easy removal for maintenance. 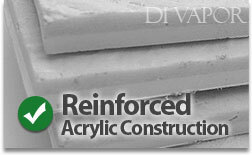 » 1-1.5mm Strengthened Aluminium Profiles. 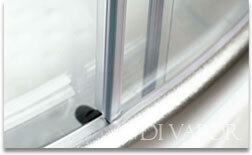 » 6mm Tempered Fixed Safety Glass and 6mm Safety Glass Panels.